Military field physicians are using the practice of acupuncture to treat cases of mild traumatic brain injuries (mild TBI), including concussions, and cases of post-traumatic stress disorder (PTSD). 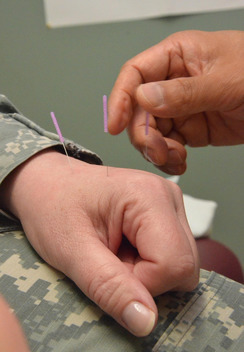 WASHINGTON -- Acupuncture and other forms of alternative and complementary medicine are helping reduce the use of opioids to block pain in Army patients, the service's assistant surgeon general said. It has just been announced that the U.S. Air Force will begin training physicians being deployed to Iraq and Afghanistan. The treatment uses small needles in the skin of the ear to block pain in as few as five minutes and can last for several days or longer.